Baking Lazarakia to eat on Lazarus Saturday is a tradition practiced in Greece and Cyprus. It is said to have originated in Cyprus, and it is significant that St. Lazarus was their first bishop. The bread is a mildly sweet Lenten bread made with sweet-smelling spices that looks like Lazarus bound up in grave clothes. Dissolve the yeast in warm water along with the honey. Allow to stand for about 5 minutes, until it becomes frothy. Add sugar and olive oil and mix until dissolved. In a separate bowl use a fork to mix 7 cups of flour with the remaining dry ingredients. Make a well in the center of the flour mixture and stir in the yeast mixture. Knead the dough (I use a Kitchen Aid mixer with a dough hook for this process.) for about 10 minutes or until the dough is elastic. (Add extra flour until you get a dough that is neither too dry nor too sticky to handle. If you’ve used too much flour and the dough becomes too dry, you can add in water by the tablespoonful until you reach the correct consistency.) Cover and allow to rise in a warm place for an hour. Punch down and allow to rise for another 45 minutes. There are several ways to form the Lazarakia. You want your breads to look like little men wrapped in burial shrouds. One way (pictured below) is to divide your dough into 13 pieces, with one piece larger than the rest. Divide the larger piece into 12 cords, and then cut each cord into half. At this point, you should have 12 pieces of dough, and 24 cords. Roll each of the 12 pieces into an oblong shape. Place an almond at the top as a face. 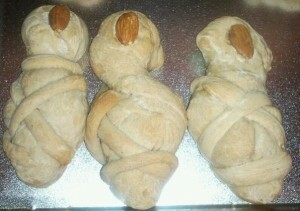 Then take two of the smaller cords and, starting just below the “face”, braid the dough together. Another way to do this is to use gingerbread men cookie cutters, and wrap the arms around the rest of the dough to create the burial shroud. Use 2 cloves for eyes. Or you can do it free-form, creating the shape of a man with a knife, and wrapping the arms around to make the shroud. When you’re happy with the form of the dough men, place the breads on an oiled sheet and cover them. Allow them to rise for 30 minutes to an hour. Brush with olive oil and then bake in a pre-heated oven of 350 degrees for 20 to 25 minutes (or until golden). The Sunday of the Prodigal Son is two Sundays before Lent. This cartoon has English subtitles with narration and dialogue in Greek and was produced by the Russian Ministry of Culture. We shall now say something about the present feast. Many celebrate the feastdays and know their designations, but the cause for which they were established they know not. Thus concerning this, that the present feast is called Theophany—everyone knows; but what this is—Theophany, and whether it be one thing or another, they know not. And this is shameful—every year to celebrate the feastday and not know its reason. The ritual of the cutting of the Vasilopita with the family, begins with the head of the household. Making the sign of the cross, he begins by praying to God that He come and bless the household, guests, and finally the food and drink that will be served. BEHOLD a new and wondrous mystery. 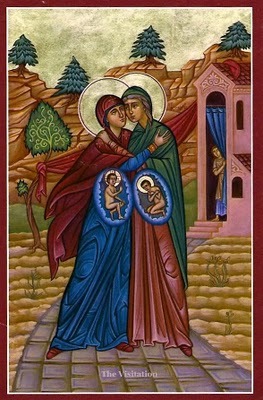 The Orthodox Church has always taught that the Ark of the Covenant was a type of the Theotokos in her Tradition and hymnography, and it is also notable to see this typology of the Theotokos and the Ark in Scripture. The Gospel of Luke tells us about the Theotokos visiting her cousin Elizabeth and the complementary accounts in II Kingdoms and I Chronicles relay the event of David taking the Ark of the Covenant to Judah. First we find that both King David and the Theotokos (with the Ark) “arose” and “went up” to Judah to the house of a Levite. 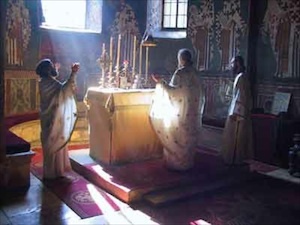 The Divine Liturgy is truly a heavenly service upon earth, during which God Himself, in a particular, immediate, and most close manner, is present and dwells with men, being Himself the invisible Celebrant of the service, offering and being offered. There is nothing upon earth holier, higher, grander, more solemn, more life-giving than the Liturgy.